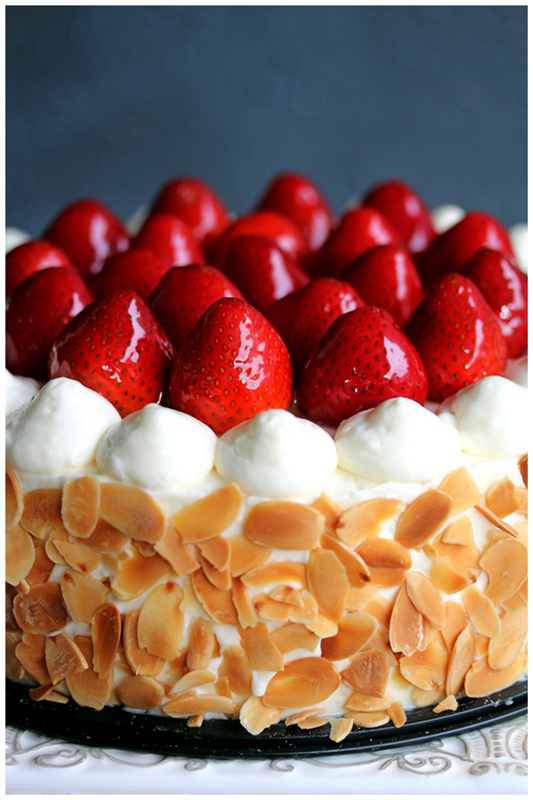 I decided yet again to make a strawberry cake for Dad's birthday. That's three times in three consecutive years already. To be honest? I preferred last year's version the best. The cake recipe I used for this year's one was just too dry. I even amended the recipe method to create a softer texture cake, but my attempt at a softer texture still failed. Perhaps it was my fault because I added in (quite a bit of) matcha powder to the plain sponge instead of removing some of the flour concurrently. Or perhaps I should have sliced the cake in three layers instead, so that more soaking syrup could have been added to increase the moistness of the cake. Preheat oven to 180C. Brush one 8" diameter cake tin with melted butter, line bases with greased baking paper. Triple-sift flour and matcha powder and set aside. Beat egg yolks, half the sugar and vanilla in an electric mixer until thick, pale and tripled in volume (7-8 minutes). Beat egg whites and gradually add in remaining sugar. Continue whipping till stiff peaks. Sift over flour in three batches, folding each batch in with a large spatula. Pour into prepared baking tin, bake until light golden and centre springs back when pressed lightly with your fingertip (30-40 minutes). Remove from oven and cool for 10 minutes on a rack. Pull cake gently away from sides of tin with your fingers or carefully loosen with a knife. Turn onto a wire rack, remove baking paper, turn back over, then continue to cool completely. Heat sugar and water in saucepan. Dissolve matcha powder in the hot water and add it into the saucepan. When all the sugar has dissolved, remove from heat. Leave to cool. Slice strawberries in half and sprinkle with sugar. Leave to macerate. Slice the cake into two equally. 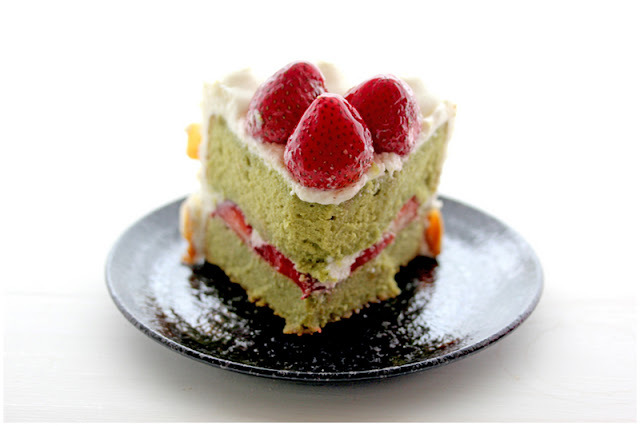 Brush the two sponge halves liberally with the matcha syrup. Place one half into a 9" cake ring, cover with whipped cream (be sure to cover the sides too). 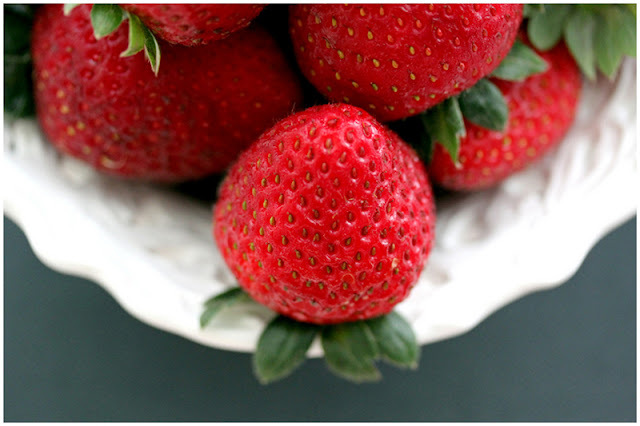 Place the sliced strawberries in the middle, top with the other sponge half and cover with more whipped cream. Leave to chill in refrigerator. 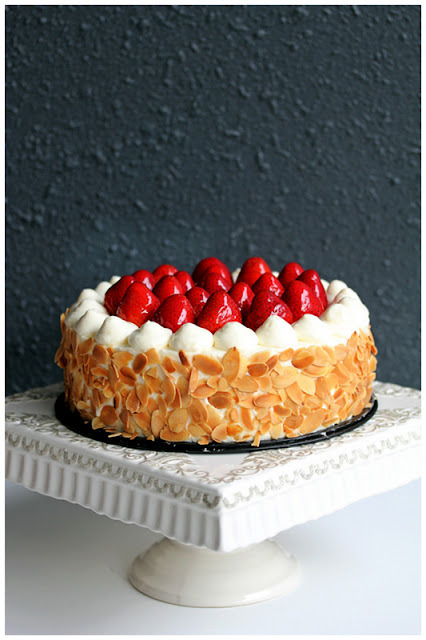 Remove the ring, decorate with glaced strawberries , reserved whipped cream and toasted sliced almonds. you should bake one every year until you find the perfect recipe. LOL I'm sure daddy won't mind eating cakes made by his daughter dearest all the time! Happy birthday to your dad and what a beautiful cake! Love the almond flakes on the side. Wow babe, this looks super awesome! I want a slice too! This reminds me of TamPoPo Deli's version of this cake....super duper yummy!